Retractable Banners is rated 4.9 out of 5 by 28. Print retractable banners that instantly stand out but also last for a long time. Rated 5 out of 5 by Wear Your Curls from Good quality and easy to assemble I bought this las month for an expo/trade show and I am so glad I did. Very reasonably priced! Rated 5 out of 5 by Landscape Designer from Great Print Quality These are great for expos and career fairs. Good quality and good price. Rated 5 out of 5 by elwood from wonderful service i purchased this banner to promote my business and took it to a deer & turkey expo. I had many positive comments about it and it stood out and could be seen from far away, making it easy for people to find my table. i will be using it for all my major events. wonderful product, quick turnaround. i'm very pleased. Retractable banners combine form and function as essential decor in your trade show booth. Create a distinct design that will last beyond the first event with our retractable banner printing features. Note: All banners come assembled in the frame and are placed in a nylon carrying case for easy transport. Choose from three sizes that are diverse in length and width. 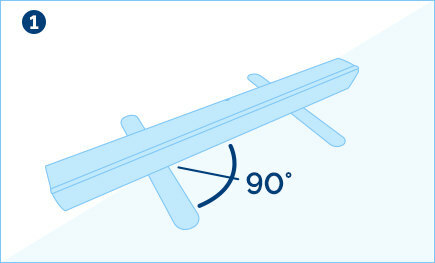 These dimensions cover the display size and do not measure the banner’s length when assembled with the accessories. 23.5” x 79” is ideal for designs meant to be read or viewed from top to bottom. 33.5” x 79” is the most popular choice among customers because of its ample width and tall length. 47” x 79” is our widest choice available, perfect for designs with more image and visual elements. All retractable banners are printed on durable 13 oz. poly film material. It has a high opacity thanks to its smooth white surface on one side and light blocking gray at the back. Designs are printed on the front, as the back side is used to hold the frame. It’s also guaranteed to last thanks to its curl resistant, waterproof qualities. Note: Our banners are meant to last indoors and are not recommended for outdoor use. 1. Base - Set the base on the ground then rotate the feet to go 90 degrees. 2. Support poles - Connect the poles and insert them in the slot found at the top of the base. 3. 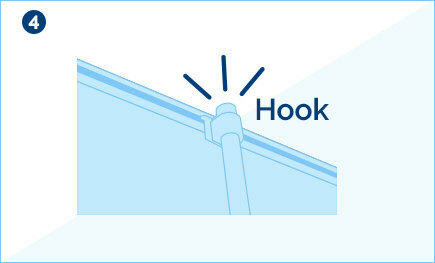 Header Bar - Lift the header bar and pull the banner up from the base at an angle. 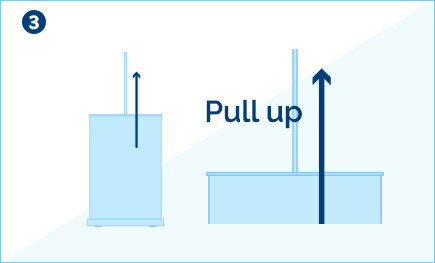 It might be harder to pull it up perpendicular to the ground. 4. 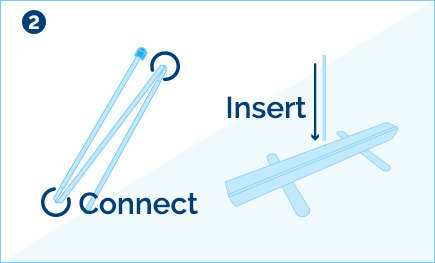 Connect the header bar and pole - Hook the top header bar into the slot located at the end of the pole. Order a pull-up banner today and it can be ready for shipping after 1 business day. Upload a retractable banner design online or download a ready template to guide you through the process. If you have any questions, give us a call and get in-depth advice from our print experts. When can I expect my retractable banner order? The roll-up banner can be ready for shipping after 1 business day. The printing turnaround is the number of days to produce your order. Shipping time to your indicated address starts after the printing turnaround. Do the indicated sizes include the header bar’s size after the retractable banner is put on display? The listed sizes only refer to the display area. It does not include the accessories after the banner has been assembled for display. Does the order come with a replacement banner? The order does not come with a replacement banner. However, the entire product can last more than 5 years with the proper care and maintenance. Use our retractable banner layout templates so your business designs are sized and formatted perfectly for your event. PrintPlace.com layout templates can be downloaded for each retractable banner size below. Retractable banners are a quick and convenient way of promoting your products and services at trade shows and expos. Retractable banner stands are also durable enough to be reused at different events for at least five years. Create an image with several banners. 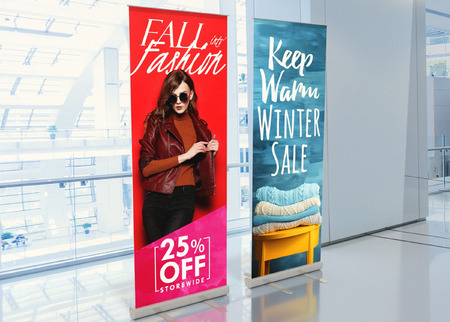 Order more than one banner and place them side by side to form a unique background or impactful image. You could create several retractable banner designs on different products and have each be part of a bigger portion. Reuse them in store or at your office. The pop up banner doesn’t have to collect dust after a convention. Display them again inside or outside your store to drive more traffic. Companies with service centers can display the banners in the area to welcome the customer. Press customers on for a purchase. You can also create a new retractable banner design as a point of purchase signage for customers. The design can encourage customers to buy complementary products or to promote bundled services. Announce big discounts for a certain order to show them which food item goes best with your new drink.